What is a Radar Plot report? How are these plots generated? What does all the information in the table mean? What are co-channel and adjacent channel warnings? What is shown on the radar plot? Can I use this to aim my antenna? What is shown in the graph along the bottom? These are compact summary reports about your local TV stations that can be download, printed, or shared. If you want to ask others for advice regarding antenna setup or reception issues, this is a great way to share information about your TV environment so that everyone can see what your dealing with. The report contains vital information about every tranmitter in your area, including things like signal strength, distance, direction, broadcast channel, callsign, network affiliation, and more. There's enough information here to address questions like what kind of antenna do you need (small, medium, or large), which frequency bands you need (VHF, UHF), and whether or not you'll need to detect stations coming from multiple directions. Printed copies of the reports can come in handy when picking a location to install your antenna or when aiming your antenna. If you're seeking help, these reports can be posted to most online forums or sent via email. There are many helpful people online that can help interpret these reports. Your exact location will be obscured in the reports so that you can share this information without giving away your privacy. These plots are generated from the FCC's database of all licensed broadcasters. The signal strength from each of the broadcasts is analyzed for your location using 3D propagation modeling algorithms, and the results are summarized in the plot and table. Transmitter power, terrain obstructions, Earth curvature, and your antenna height (if specified) are already factored into the report. Digital channels are listed with blue text while analog channels are listed with violet text. Please understand that this is a simulation and can only be treated as a rough approximation. Reception at your location is affected by many factors such as multipath, antenna gain, receiver sensitivity, buildings, and trees - which are not taken into account. Your mileage may vary. These are the call letters that the FCC uses to uniquely identify broadcasters. This is the broadcast channel for the station. For most digital channels, two channel numbers are listed. In the world of digital TV, the broadcast channel is usually aliased to a different channel to match a corresponding analog channel (e.g., a broadcast on channel 30 might appear as channel 4.1 to the user). However, since antenna selection really depends on the broadcast channel, it is more important to pay attention to the first number. This is the predicted Noise Margin (NM) of each channel "in the air" at your location, specified in dB. You must add/subtract any gains/losses you get from your antenna, building penetration, amps, cables, splitters, and other factors present in your situation. Hypothetically speaking, you need to end up with an NM value above 0 in order to pick up a station. This is the predicted signal power of each channel at your location, specified in dBm. Note that the relationship between NM and Pwr depends on the type of signal being detected. Analog stations require more power than an equivalent digital station to achieve the same level of NM. This indicates the path travelled by the signal to get from the transmitter to your location. Distance from your location to the transmitter, specified in statute miles. Azimuth direction for the transmitter (0=North), relative to true north. The numbers have been color coded according to the transmitter direction for easier identification of channel clusters. Transmitters coming from approximately the same direction will have similar colors, matching the colors in the outer ring of the radar plot. Magnetic north readings are also provided for easy compass pointing. When using a compass for orientation, the "North" end of the needle should point to the red colored "N" on the radar plot. You can use the magnetic north azimuth values (in parentheses) to aim your antenna via compass. The most important number to pay attention to is the Noise Margin, in the "NM(dB)" column, for each of your local channels. These values tell you if you are above or below the detection threshold for each station and by how much. Since these values represent the amount of signal "in the air" at your location, you need to have enough margin to account for building penetration, cable loss, splitters, tuner sensitivity, and other factors specific to your setup. If you take the initial NM value for a given channel, add your antenna gain, subtract all the other system losses, and still end up with a value above 0, then you should be able to detect that channel. Another way to think about Noise Margin is that it's the total amount of noise or signal degradation that you can endure before the signal drops into an unusable state. Things like building penetration, cable loss, and splitters are just a few examples of things that might eat away at your available Noise Margin. If the Noise Margin ends up below zero after accounting for all the losses in your setup, then the channel is probably no longer watchable. Antenna gain is the only quantity that should ever be ADDed to the NM value. Most antennas will specify their gain in dBd or simply dB, and this is the value that should be used. If an antenna's gain is specified in dBi units, then you need to subtract 2.15 in order to get the equivalent value in dBd units. If an antenna has a built-in amp, the extra gain from the amp SHOULD NOT be included as part of the antenna gain (this actually subtracts from the Noise Margin as we'll see next). Only the raw intrinsic gain of the physical antenna should be added to the Noise Margin. Be aware that amps and pre-amps will actually cause you to lower your Noise Margin. No matter how much gain an amp or pre-amp claims, it will actually reduce your Noise Margin by the amount listed as the Noise Figure (NF) in its specs. High quality consumer-grade amps usually have a Noise Figure of around 2-3 dB. Lower quality amps or ones that do not specify a noise figure at all will probably have a Noise Figure of around 6-10 dB. This is true for both stand-alone amps as well as antennas with built-in amps. This Noise Margin degradation is caused by limited efficiency of the electronics at the input of the amp prior to the signal being boosted. The primary benefit of the amp is to overcome further NM degradation from "downstream" losses (e.g., long cable runs, splitters, tuners with poor sensitivity, etc.). In other words, you suffer the amp's Noise Figure degradation once, and can usually ignore most of the other losses that occur after it. Green (indoor) corresponds to channels with an NM of about 35 or higher. This is typical NM needed to deal with building penetration losses, poor gain of a small form-factor antenna, limited sensitivity of the TV's tuner, plus significant padding to handle random signal degradation (e.g., people walking by, severe multipath, interference, etc.). Yellow (attic) corresponds to channels with an NM of about 15 or higher. An attic installation usually consists of a slighty larger antenna and possibly a pre-amp to overcome any cable or splitter losses that follow. With higher antenna gain, less building penetration, and generally lower signal degradation, an attic installation will have a better chance of pulling in those slightly weaker stations. Red (outdoor) corresponds to channels with an NM of about -5 or higher. With an antenna on a mast or on the roof, there will be fewer instances of signal degradation / multipath and there will be no building loss at all. It is actually possible to use a very high gain antenna to pull in a channel with a negative initial NM value and raise it a usable level. For the weakest channels, it is important to use a high quality pre-amp so that cable losses and other components don't rob you of the precious NM gain from the antenna. NOTE 1: If you are going to compute the detailed gains and losses of your RF signal path, please remember to leave yourself several dB of spare NM as a buffer against random signal degradation. Although it is theoretically possible to get a channel at 0 dB NM, this would probably result in a very unpleasant viewing experience because random signal fluctuations will probably cause the signal to dip below the threshold quite often and result in drop-outs, macro-blocking, or other artifacts. A pad of 5 to 10 dB will usually clean things up. NOTE 2: If you live very close to some transmitters, you might see a few of the values in the "Pwr(dBm)" column highlighted in red if power levels get a bit high. This is a warning that such high power levels might be enough to cause overload problems on some amps and receivers if you're not careful. Co-channel interference is when two different transmitters are broadcasting on the same channel and interfere with each other. In the U.S., thousands of broadcasters are sharing channels 2 through 69, so naturally, each channel must be shared by multiple broadcasters. When the FCC assigns channels to broadcasters, it tries to keep same-channel broadcasters as far apart from each other as possible to minimize interference. Even so, there are many areas that are "in between" broadcasts on the same channel. Depending on the severity of the interference, the direction of the transmitters, and the type of antenna being used, the end-user might see both, one, or neither of the channels in places where two channels collide. The co-channel warning indicator is placed next to channels in the table that are potentially at risk of having a co-channel interference problems. It does not mean that you will necessarily have problems, but it's just something to watch out for. Adjacent channel interference has more to do with your receiver. Some tuners are built with very poor adjacent channel rejection. That means that if you are trying to watch a weak channel with a very strong signal on an adjacent channel, the tuner can't pick out the weaker channel because the strong one is drowning it out. This type of scenario might occur if you happen to live right next to a TV transmitter. Channels from the nearby transmitter will be much stronger than channels from distant transmitters, and the difference might be enough to prevent you from receiving those channels that happen to have strong channel neighbors. Most receivers have good adjacent channel rejection and are not very susceptible to this kind of problem, but in case you do have this problem, a warning indicator is placed next to channels at risk of having this kind of interference. This is called a "radar" plot because of its strong resemblance to a standard radar (radio detection and ranging) display. Your coordinates are represented by the point at the center of the plot. The bars show the direction, signal strength, and channel number of the local TV signals in a compact visual way. If you enter a different location, the directions and lengths of the bars would change to show the conditions at that point. The bars "originate" at the outer edge of the plot like they are reaching over the horizon. Each bar on the plot represents a transmitter's output. Longer bars represent stronger signals reaching your location. The direction of each bar represents the direction of the transmitter relative to your location. The number next to each bar is the broadcast channel number for that station. Note that the virtual channel number for digital channels are unimportant when choosing and aiming antennas. Some of the bars are also drawn thicker and with a yellow outline. This is done to distinguish channels that are in the VHF band as opposed to the UHF band. Since UHF channels and VHF channels require different types of antennas for proper reception, it is important to know which type(s) of antenna(s) you need to use and where to point them. Yes. If you are using an indoor antenna, this report will help identify which side of your home is facing the transmitters. Larger antennas, especially those installed in the attic or outside, need to be aimed more accurately for best reception. 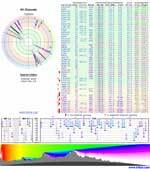 This report can tell you the precise direction of each transmitter relative to your location. The top of the radar plot points due north, exactly as you'd see it on a map. If this plot was placed over a map of your location and properly aligned to north, then each of the bars would point directly at the transmitters they represent. The exact direction for each transmitter is also listed under the azimuth column on the table. Azimuth is measured starting with 0° pointing due north and increasing in a clock-wise direction until reaching 360° at north again. In other words, north is 0°, east is 90°, south is 180°, west is 270°, and you end up back at north when you reach 360°. Note: This plot (and maps in general) are referenced to true north, however, most people would use a compass to find their orientation. Depending on your location, there can be a difference of several degrees between true north and magnetic (compass) north. A red "N" is drawn on the plot to indicate the direction of magnetic north. If you are using a compass to orient yourself, the compass needle will be pointed toward this "N" and you can see where the transmitters are located relative to that. The exact azimuth values relative to magetic north are also provided in the table of transmitters. For more information about the Earth's magnetic field, see the http://www.ngdc.noaa.gov/ web site. This is a "power spectrum" graph showing the relative signal strengths of each of the stations in their respective channel slots. This is a quick way to tell how many channels are in the VHF / UHF bands and can also help visualize some of the co-channel and adjacent channel interference issues. Each short horizontal bar represents the predicted signal strength of a broadcaster at your location. Each bar is labeled with the call sign of the station that is broadcasting. Some of the markers might be drawn in a semi-transparent color. This is an indication that the station being represented might be buried by another transmitter due to co-channel interference.